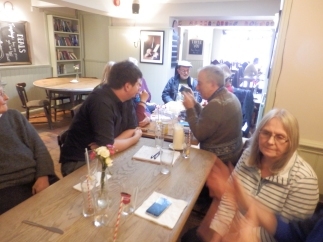 Our first meeting of the year was at the Marsh Harrier pub in Oxford: 16 people dropped by to chat. Discussion ranged over how our hives had fared over winter; floor debris advice for newbees; problems with badgers; Small Hive Beetle; hive thefts; and poisoning from crop sprays. Zero losses due to varroa despite non-treatment – 98% of our colonies are untreated and of feral stock or outbreed freely with local stock – draw your own conclusions . Slightly more winter losses in rural areas than urban – which we attribute to poorer forage (monocrops). Around half the casts we capture die either before or during winter – symptoms resemble queen failure though, it may simply be that they just never built up enough stores, so they limit their numbers to too small a cluster to keep warm. But prime swarms reliably thrive. However, we are seeing more losses this last winter (2017-2018, not yet formally surveyed). Anecdotally, these are more attributable to starvation – either they have run out or they have become isolated from their stores. This winter has been harsh, because spring has had several false starts, fooling some colonies into breeding too early and then running out of stores. Stefanie told us how she lost one colony over this winter, but it was that rare beast: a swarm from a swarm (i.e. she got a nuc last year, it swarmed; she put that in a hive and a few weeks later that swarmed). It was a small colony late in the season and did not build up enough to survive. Norman said he just lost two colonies to pygmy shrews, which was a new cause to him (and us!). These are a protected species, so good luck Norman! Annie has not been beekeeping long and so sought some advice. She showed us pictures of the debris on her hive floor and asked what they revealed. Will H, having no windows on his hives, mainly inspects his colonies via entrance activity and their floor debris and so interpreted. Although there seem to be a lot of dead varroa, the inspection tray was in place over the whole of winter so it is a low average drop and don’t worry about it. You can see how this is not a large colony: the wax falls below the combs like a shadow, revealing its size, and incidentally showing that the comb is at an angle to the bars (Annie confirmed this). 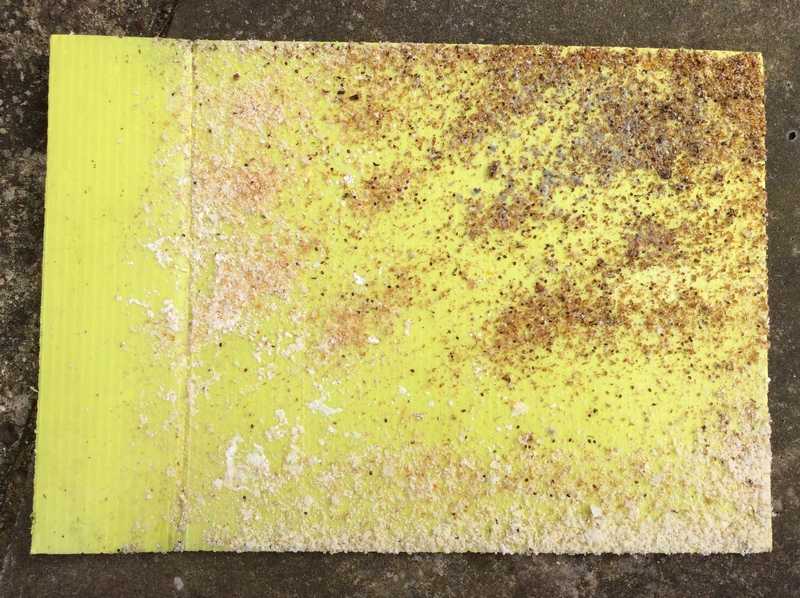 The darker areas are under brood comb (pollen, propolis, and most of the dead varroa) and the white granules are a mix of honeycomb cappings and crystallised sugar. The ant-sized bug can be ignored – there is an entire ecosystem of pollen mites and other cohabitants down there, doing no harm. Andrew used to have 16 Nationals, until one day he slipped a disk lifting one and was in hospital for a while. Whilst there his wife gave away all 16 hives! Some years later he took up the craft again, but with Warrés as he was always really keen on observing bees, and he finds they are very calm despite being random swarms he’s collected. He’s recently got a Top Bar Hive as he misses being able to examine things up close. He lost two colonies to a new cause, acute paralysis virus last year – this leaves bees black and shiny. This led to an illuminating conversation between him and Norman about how National hives’ roofs are almost designed to help breed wax moth by giving them somewhere to hide. They used a phrase I was unfamiliar with: “wax moth is evidence of bad beekeeping”. Small Hive Beetle (SHB) – this pest has spread to Italy and will inevitably arrive here, so we’re beginning to think about management strategies. Like varroa, the threat may be overstated, and affect mainly conventional practitioners. Reports from areas it is already in indicate it is not a problem for large, thriving colonies, which harry it out of the nest. But, it hides in unpatrolled areas of the hive and so a large area of unused (empty) comb is ideal for it. Warré hives have fewer crevices in their construction and honey is stored immediately above the brood nest so bees patrol even honeycomb a lot; what we need to be vigilant for is the unpatrolled empty comb that is sometimes found (usually in lower boxes) during dearths, when bees eat their stores. Horizontal TBH’s may have more of a problem with unpatrolled comb. Conventionally kept hives are thought to be more susceptible to SHB (and probably Asian hornets) than low-intervention hives and feral colonies, because opening hives weekly releases regular clouds of alarm pheromones and honey smells, which has been shown to attract SHB from 10km downwind. SHB may be a minor nuisance in the UK as we don’t have the heat and humidity for the beetle to thrive. However, it will change how people harvest / process honey, which will have to be done within a couple of days of harvesting unless you freeze it. SHB can definitely hide from bees under varroa meshes, which the beetles can usually slip through. As most natural beeks don’t bother counting the mite drop, the meshes are pointless for us and it seems prudent to remove such meshes where feasible. Badgers – I need to relocate some TBHs and have found a good spot but it has badgers on site. Others in the group have badgers near their TBHs and say the hives are ignored. Reading around, it looks like UK badgers only go for hives if there is a long period of frozen ground (they normally eat worms). I’ve decided to go for it, but reinforce the floors of the TBHs with thick planks of wood. I do know one beek who has lost a lot of Nationals to badgers: it looks like a badger on his farm has learned hives are easy food sources, so best not give them the opportunity to find out! Fear of bees – Beekeepingforum.co.uk has an interesting thread where people describe hives that have unnerved them. There seem to be two main ways people get over this. One is knowing you are invulnerable in a good bee suit; the other, is by mentoring other people who are reluctant to open their own hives. It seems that helping others overrides your own fear. Norman Guiver, the technical director behind the beeWatch app was present at the meeting to promote it. As a conventional beekeeper with a commercial agenda, this is very much tangential to our ethos and usual casual meeting style, but it is good to occasionally mix things up a bit and get different perspectives, so we were interested to hear from him. He explained how the app was motivated by him losing 7 colonies in 2 years to, he believes, spraying by nearby farmers who are not warning beekeepers about their activities. There is already a service called BeeConnected, but no one ever seems to get warnings from it (I have never been notified by it and note similar comments on forums) – probably because it is not straightforward for the farmers to use. Whereas beeWatch allows the farmer to simply whip out his mobile phone and use its GPS function to say “I am spraying here”, whereupon every beek within 5km is alerted. Having created an app, it was straightforward to add functionality to help with swarms. Once one is reported to the app, those who’ve registered an interest nearby are alerted and the first one to claim it is assigned the swarm. This automates a process which is normally bottlenecked by availability of swarm co-ordination staff. Although these functions are elegant, on balance he met with some indifference, as our styles are very different and our members generally have not experienced problems with spray poisoning, presumably because they just don’t happen to live near such farmers. So while it was thought a reasonable app, paying £12 / year for it didn’t generally appeal to our informal network. We get plenty of swarms already through our own network of contacts. Interestingly, he sent samples of bees he thought were poisoned to the NBU, as they suggest here, but it seems they no longer have the funds to analyse samples sent to them! We were intrigued to hear that his research indicates that the majority of the pesticides / insecticides used in the country are not used on crops, but on or in: golf courses, vet prescriptions (anti flea, etc), chicken farms, allotments, equestrian centres, garden maintenance companies, and garden centres. Bee thefts hit the news a few weeks ago with the theft of 40 hives in Oxfordshire. These thefts must be by other beekeepers and it is terrible to think that our normally collegiate and helpful communities can harbour such selfish parasites who care so little for the welfare of the bees themselves and see them purely as a commercial asset. As a protection against such thefts, Norman also talked about their other product, the uWatch cube (a security camera / tracking device which can take night time IR photos of thieves stealing a hive, etc and alert your smartphone). Norman explained that thieves now use Google Earth to look for rows of hives and other valuables. A single hive might be missed but a regular array of identical blocks on an aerial view is a giveaway. I don’t think theft is of such relevance to natural beekeepers yet, as thieves tend to look for entire conventional hives to take, and our non-standard hives tend to be very heavy, and the combs are not usable in framed hives. However, I have heard of a case in Oxfordshire where a Warré hive’s bees were stolen by being shaken out of the hive into a box; this was in full view of CCTV but the perpetrator was never identified – but they left behind a crown board so must have been a conventional beek. Thank you to everyone who came along, particularly Jack who invited us to see his hives nearby (but we ran out of time) and Norman who had a somewhat ‘challenging’ but friendly reception! This entry was posted in Meetings, Pesticides, Pests, Swarms and tagged acute paralysis virus, apps, Badgers, SHB, small hive beetle, theft. Bookmark the permalink. Interesting post, thanks. Andrew’s wife was obviously waiting for her moment! Paul – thank you for that excellent report on an interesting meeting. I thought it might be useful for members to see how to recognise Acute Paralysis Syndrome (one of several names to describe the condition). Apart from being hairless, black and shiny, the bees couldn’t fly, apparently because their wings were dislocated. This photograph was taken on 4 April last year and the condition became so bad that there were piles of dead and dying bees outside the hive entrances every day. It is thought that the virus is spread by bees in close contact in hives that have become congested, but the bottom boxes of mine were only half full. Hoping that nature would find a cure, I left the hives alone and bees were still flying from them in July. By then, however, they had become so weakened that, unknown to me, they had become infested by wax moth. Another lesson to learn: always remove bits of burr comb from the hive area. This photo shows that I had failed to do so, and that could have attracted the moth.